Tedbar Tinker Hire in the South Yorkshire UK City of Sheffield is a main stockist for the hire and sale of quality lifting equipment. Catering for the local needs of businesses, contractors, and industrial users in Sheffield (as well as in Rotherham), a wide range of lifting products is available for purchase or hire including products that include hoists, a frame gantry units, manual and electric chain blocks, lifting magnets, pull-lifts, genie material lifts, chain slings, shackles, girder clamps, girder trolley units, tirfor machines, eye bolts, test weights, web slings and webbing slings, minifor wire rope hoists, load arrestors, lodestar electric hoists, and more. Tedbar Tinker Hire are an agent for the sales of most well known branded items of lifting gear and lifting tackle in Sheffield. If you would prefer to buy one or more items of lifting equipment as opposed to hiring it, simply contact us for a competitive price quote on the product required. We specialise in the sale of quality products from brands that include Alfra UK, Camlok, Chicago Pneumatic, George Taylor, Genie, Reid Lifting, Sumner, Tractel, and many more. 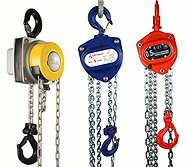 Our most popular items that are regularly hired by builders, contractors, engineers, mechanical fitters, machinery movers, installation engineers, and other trades are our manual chain blocks, pull lifts, hydraulic jacks, plasterboard lifters, minifor rope hoists, web slings and d-shackles, our girder clamp and girder trolley units, and our a-frame portable gantry units. Contact Tedbar Tinker for a No Obligation Price Quote Before Buying from Elsewhere! Apart from time you have nothing to lose from contacting us for a free price quote to supply you with the make and model or alternatively the quantity and specification of lifting equipment in Sheffield that you wish to buy! Tedbar Tinker is one of the most established local suppliers in Rotherham as well as in Sheffield that provides the cost effective service of temporary lifting products hire. Founded over 25 years ago, Tedbar Tinker Hire supply quality equipment that is used for lifting, jacking, moving, and shifting - that is of the highest quality and which is rigorously maintained to the highest of standards. By choosing us you have access to perhaps the largest range in Sheffield of manual chain blocks, genie lifts, web slings, load cells, pallet trucks to hire, and jacks. Save Money with Tedbar Tinker Hire! We aim to save you money on any brand, model, or item of lifting equipment in Sheffield. Please contact us for a no obligation price now! If you are a Business user, a Contractor, or a local Business or Commercial user who needs to balance your expenditure with industry standard payment time scales, we invite you to open a trade account with us (subject to status) to let you enjoy a fast equipment hire service as well as trade rates on the complete range of products and services that we provide. Please Ask Us For Details Now! For any more details, any product information or specifications, or to apply to open a trade account, - please contact us. If you wish to buy web slings in Sheffield or Rotherham we offer competitive prices on a full range of slings including duplex slings, endless round slings, flat belt slings, and extra wide webbing slings. These conform to EN standards and are fully detailed with date of manufacture and the swl limit. 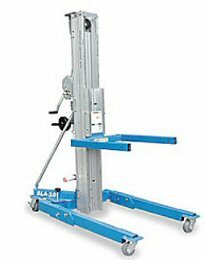 Looking for plasterboard lifter hire? 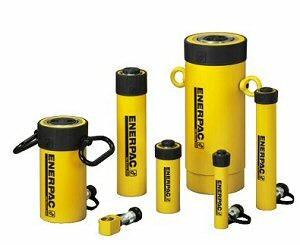 Or maybe where to obtain hydraulic puller or hydraulic body ram hire? We can supply these as well as rsj / girder clamps, genie material lifts, pallet truck hire Sheffield, and much more!